Numbs Your Skin Fast and is Long Lasting (up 3 hours and 30 minutes)! What is Dr. Numb and how does it work? Dr. Numb™ contains lidocaine, a substance that has been used for many years as anesthetics in medical and dental offices. Dr. Numb contains more of a pure form of lidocaine which acts as the numbing anesthetic cream for the skin. The purity is very important, because not all lidocaine is manufactured and refined as Dr. Numb has been. Pain is caused by the stimulation of pain receptors at the ends of the nerves. The stimulation causes sodium to enter the nerve ending, which causes an electrical signal to build up in the nerve. When this electrical signal is big enough, it passes along the nerve to the brain, where the signal is interpreted as pain.Dr. Numb™ works by temporarily blocking this pathway of pain signals along nerves. 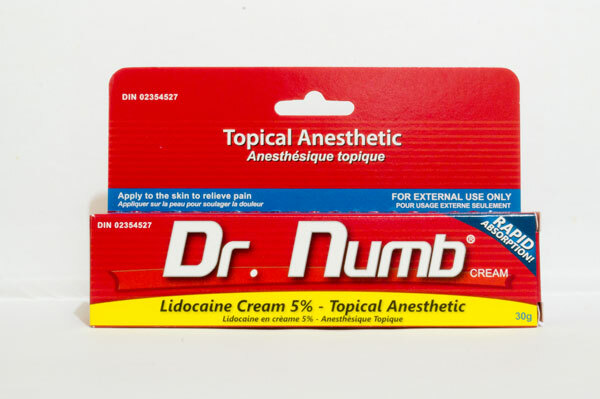 Dr. Numb numbing anesthetic cream does this by stopping the sodium entering the nerve ending at the site of the pain. This prevents an electrical signal building up and passing along the nerve fibers to the brain. Now that the cream has been rubbed into the body, place an additional, thin layer of cream over the area. Cover the cream with plastic wrap. The heat under the plastic wrap helps activate the cream, and keeps the cream form drying off. Leave the cream on the skin longer for better result. Don't remove the plastic wrap until you feel the numbing effect.